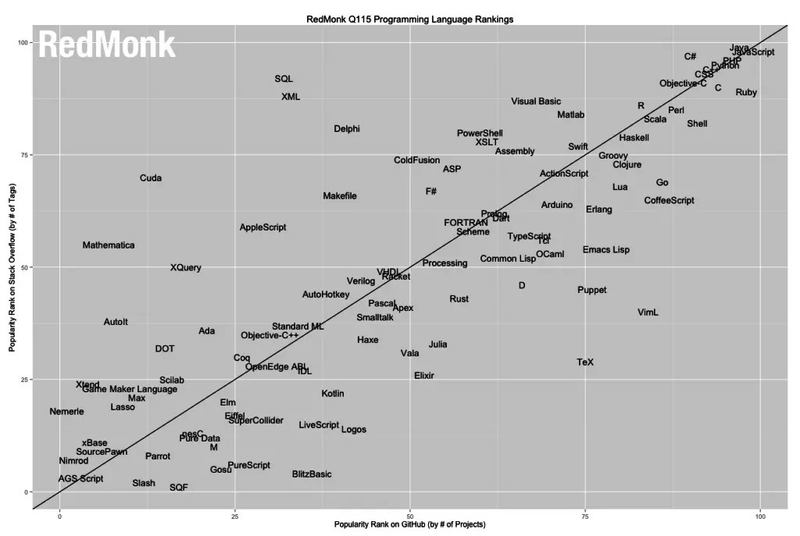 What’s the Best Programming Language to Learn in 2015? I’ve been following programming language statistics for several years. There are a number of data sources including code repositories, Q&A discussions, job advertisements, social media mentions, tutorial page visits, learning video views, developer surveys and more. Data is published at different times, none can be considered accurate and all have flaws — but they can be useful for spotting industry trends. The TIOBE Index rates languages on the number of skilled engineers, courses and search engine rankings. I combined C and C++ and ignored CSS and shell scripting. CSS isn’t a programming language as such although preprocessors come close. Shell scripts are useful regardless of whatever technologies you adopt but you won’t find jobs where it’s the only language you need. GitHut and RedMonk are similar but that’s to be expected since they use GitHub as a primary source of data. Both analyze public rather than private repositories which could sway results toward open source technologies. TIOBE is influenced by search engine resources. This is possibly why C tops their chart — the language was developed in 1969 and many historical documents are available. Newer languages such as Ruby and Go inevitably appear further down the chart. Educational resources are likely to affect results. For example, Python is commonly used to learn programming in schools and colleges. Many thousands of students are asking questions and completing projects but, in my experience, Python jobs are rare compared to PHP or Ruby despite it being higher in several charts. Java has a similar advantage since it has a variety of uses in education, web, desktop and mobile development. Demand for native app developers remains high especially in the job-related surveys. RedMonk reports that Swift jumped 46 places to number 22 in less than six months. However, app development is a young discipline. There are far more job vacancies in web and desktop programming but they are easier to fill so adverts are possibly removed sooner. Finally, language use has an impact. A single web site or application requires a myriad of technologies which possibly raises them above desktop languages. Comparing today’s charts against historical 2014 data from RedMonk and Jobs Tractor, surprisingly little has changed. A few languages have gone up or down a place but there are no new entrants or large leaps into the top ten. There is no “best” language. Few developers have the luxury (or tedium?) of working with a single technology. The more technologies you know, the more you need to know. OK, But What Should I Learn? First, find a problem — especially one which has a personal interest or benefit to you. Perhaps that’s creating a résumé website, organizing your finances, automating your home or sending random tweets to your followers. Ensure the goals are achievable; even the best developers would shudder at the thought of creating a WordPress or Call of Duty clone. Now choose an appropriate set of technologies. There may be several options but don’t attempt to force a language on the solution. You may be able to create a native mobile app in Perl but resources are rare and it’ll be a frustrating exercise. Then create your solution. Google, code examples and fellow developers are helpful but don’t expect them to provide all the answers. Your project is (or should be) unique and only one person can teach you to program: you. Finally, don’t expect to become a coding ninja overnight. Some people have a natural aptitude but they also spent many, many hours honing their skills and are continually learning new technologies and techniques. Even the most junior roles presume several years development experience. If you find you need a hand along the way, there are plenty of online resources, like our very own Learnable, that can help. Hajj! what does it mean that ?